2nd class Post and Go stamps from new NCR machines at last!! Just over a year ago Royal Mail launched 2nd class Post and Go stamps in two values, at Stampex. 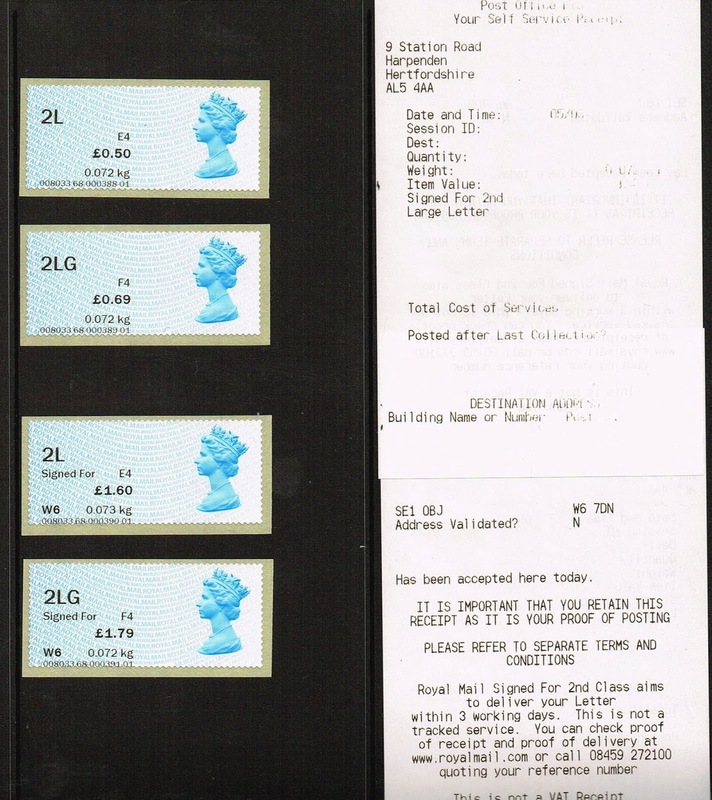 However, even then we knew that it would be necessary to convert or replace the existing Post and Go machines in branches before the new stamps could be sold. All through 2013 there were rumours that introduction would be 'within a few weeks' (or months) but nothing happened and there was not even an announcement at Spring Stampex 2014. However, two new machines were installed in the Harpenden (Hertfordshire) Crown Post Office, and went live last Friday, 28 February 2014. NCR kiosks short and wider than the existing Wincor units that are currently found in over 200 Post Offices, feature faster processing of almost all Royal Mail and Parcelforce products that are usually only available at the counter. Customers can choose from 8 different stamps for later use (as on existing Post and Go machines, and including the 2nd class pair) or process their mail quickly and easily using the intuitive touch screen- which produces a never-seen-before Open Value (or 'OV') Stamp. Almost all mail can be processed though the kiosks- both letters and parcels -including inland first and second class mail, International mail and priority mail that includes tracking and delivery guarantee worldwide. Thanks to Brian Sinnott postagelabelsuk for the information and use of images. No information is yet available on the roll-out of these machines but I have been told that Plymouth Crown Office is already preparing the space! See here for new installation reporting. Ian - I know this is Harpenden Crown Office, but what is their address and post code please ? Does the Open Value stamp replace the current non-pictorial 'PAG' label? If so, a sensible move. The OV illustrated appears not to have a 'Post by' date - another welcome feature. As they bear both the service indicators and a monetary value do they have open validity? Surely once the rate rises the label will need additional stamps to make up the value to the current rate, otherwise you are likely to get an underpayment card instead of your item of mail. I don't think anybody has referred to them as 'Open Validity'. I believe the term used officially is 'Open Value' to mean that the value is variable depending on the service and weight. In the language of the Horizon labels, doesn’t 2L stand for 2nd class Large letter and cost 69p not 50p? This shows that LLet is the designation for Large Letter (with RSF Recorded Signed For). So I assume 2L is 2nd class letter and 2LLet is 2nd class Large Letter. Without the L there would be no indication as to the size of the letter or parcel. For 2nd-class letter, the open value indicia is 2L. 2nd-class large letter is "2LG". Of course, the value will vary with the format as well as the weight. Any ideas how you would collect these? Are there a reasonable number of permutations to give a small representative collection? The variables involved are the destinations, package formats, and services. Destinations could be domestic (UK & Channel Islands) or international, which affects the list of available package formats (letter, large letter, small parcel, etc.). The destination, package format, and also the weight determine the services available. As you can guess by now, walking down every possible permutation could take a long time. I suppose collectors who class Horizon labels as stamps will want these also - I won't! Isn't that the joy of the hobby - everybody can do and collect what they like. All labels are part of postal history - collect them or not as you wish. Enjoy them - but tell your heirs they won't inherit a fortune! Address given is CORRECT for the PO. Not too impressed over kiosk performance. Too many screens just to post an item which allows one to access the new versions of the PAG/Faststamps. One screen asks about whether contents are prohibited and another about content value even if one is going for the "50p" or "60p" values. Suggest a rethink as to whether all these screens are really needed. Both the prohibited content and the screen asking for any other items to be scanned are there for legal reasons. These confirmation screens are required by Post Office and/or Royal Mail for legal reasons. It's true that they seem to interrupt the flow, but there's not much that can be done to get rid of them unless Post Office and Royal Mail reconsider them from a legal standpoint. In theory the question about prohibited items should be asked when you post items larger than a letter at the PO counter, but often they are not. I'm not sure that there is a legal requirement for the question to be posed by the terminal for small items. I'm not even sure about the wisdom of asking the question at either the counter or on the machine as a anybody can give a false negative answer, and without a sender's address, nobody can be charged with sending prohibited items through the post or with giving a false answer. The question about content value is often asked at the counter in crown offices (less so in sub-offices) so that the sender can be reminded about levels of insurance/compensation. But even then the answer provided by the sender can have unintended results. If I sell something on eBay for £300 I might be persuaded to send it by basic Special Delivery for compensation up to £500. But if the package goes missing, that compensation guarantee only covers the *COST* to me of the item I have sold (and then only if I can prove it), rather than my actual lost sale. If my cost was only £20, or I can't prove the cost because it was something I bought many years ago or inherited, then my compensation will be much less and special delivery would not have been necessary. Do the NCR machines spell the end for Tudor Street? Or will the NCR machines be used to augment the number of branches which don’t currently offer Post & Go? The answer to your second question is almost certainly ye; I'm not sure what lies behind your first question. The same machines could be adapted to be suitable for unmanned offices (ie offering only the purchase of stamps). You can't get a certificate of posting from Tudor Street now, as you can at Eastcheap. As I understand it from a discussion at an other office (with Wincors) this system has been shown to staff from a number of offices and that they have been told that the kiosks will have to be manned because of the "special" services. At Harpenden, even asking for a certificate of posting on the NCRs generates a call for a staff member to attend and the machine locks on the "call" screen until the staff member swipes a card across the laser scanner. 48hr parcel service similarly and had staff member go for the appropriate labels after a card swipe, Hope to have my impressions typed up by the end of month with some of the screen images for ATM Informer. Would welcome input from others posting here. If Ian permits, my e-mail may be added. 18 touches on the screen to purchase one stamp? I think someone at the OED should seriously consider updating the definition of "progress"! Agreed, Anonymous (9/3/14), and I have the photographic evidence!